Diesel engines are everywhere — and they’re often hazardous to employees. According to the Occupational Safety and Health Administration (OSHA), these kinds of engines are used to power a number of different kinds of vehicles, heavy machinery and equipment. There are also a number of industries that use these engines, including mining, agriculture, construction, maritime, manufacturing operations and the transportation industry. The primary hazard is the exhaust that these engines produce. This gas contains a mixture of small particles and gasses that can create serious health hazards when they’re not properly controlled. Our Boston workers’ compensation lawyers know Diesel Particulate Matter (DPM), which is a component of the exhaust that includes dangerous particles like silicates, sulfates, ash, carbon and metallic abrasion particles, is an increasingly studied risk faced by many employees in varied workplaces throughout the United States. Workers with potential exposure risks to these materials include those in many industries. All workers in the vicinity of these engines and diesel fumes are at serious risks. What are the short-term health effects of diesel exhaust? What are the long-term health effects of diesel exhaust? So we know about the risks that are associated with exhaust fumes and particles, but what can we do to avoid them? It’s important that you’re limiting your speeds and using one-way travel routes. This is going to eliminate traffic congestion and close run-ins with exhaust. Make sure that operators are limiting their time idling or lugging engines. It’s also a good idea to limit the total horsepower of the operating engines. This helps to reduce fumes emitted. There should also be areas that are off-limits for diesel engines. 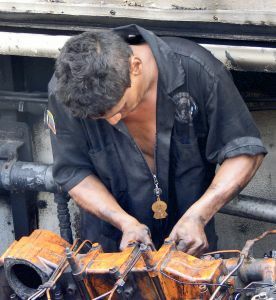 To help to control the exposure to these kinds of fumes, employers should be making sure that they’re performing preventative maintenance on their diesel engines. They should have the proper exhaust filters, should be clean burning engines and should have diesel oxidation catalysts. All of the cab areas in these machines and vehicles should have air filters. Workers should not be exposed to these fumes on the job. Another way to manage the intake of these fumes is to install main or auxiliary ventilation systems. These can be installed as a stack exhaust or a tailpipe exhaust. All of these preventative measures will help to keep your workers alive and well. Your best bet is to stay away from these engines. Limit your time working near them and make sure you’re getting enough fresh air. It all sounds so simple, but too many workers are spending their work day in close quarters with this machinery — and their health is suffering because of it.